Welcome to Round Rock ISD, the Destination District for Public Schools in Central Texas. Round Rock ISD serves students in Round Rock, Cedar Park and Austin. This page will help guide you through the steps to securely and conveniently complete the required student forms for returning and new students. Find your attendance zone using the Round Rock ISD school locator. If your address falls near the District boundaries, please contact the elementary or secondary education departments. Complete the required student information forms online by clicking the link above under New Students. If your student is enrolling from an International School, Home School, Non-Accredited School, or an Accredited School, visit our Transcript Evaluation page to begin the credit evaluation process. Next, visit your school. Campus Registrars begin accepting eligibility documentation July 23. Parents or guardians of new students must present the following items to complete enrollment: Contact your campus with questions. – current utility bill indicating the address and the adult’s name. 5. Social Security Card (if available). 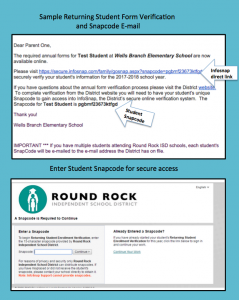 Round Rock ISD uses InfoSnap, a secure database that quickly, easily and safely manages required student forms. 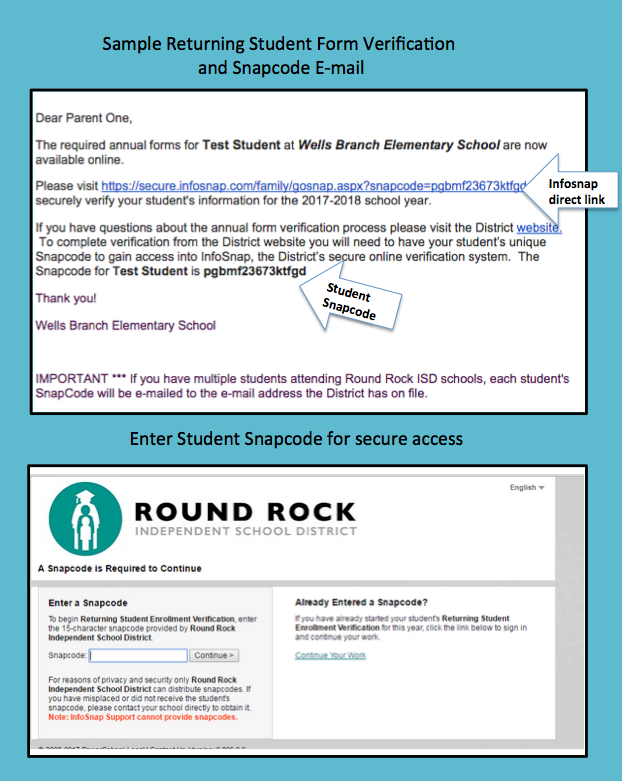 Once the SnapCode is entered into InfoSnap, required student(s) forms can be securely verified or updated. – If vital record changes are made, including address, student name, date of birth, or immunization records, parents/guardians must go to the campus to validate the information. All student transfer applications must be submitted directly to our Round Rock ISD student transfer office. Student is moving into the receiving school zone within 60 days and has provided a contract/lease to the Student Transfer Office. Student wants to be in a program that is not offered at their home campus. Learn more about transfers for your student’s grade level. Round Rock ISD knows that each student is a unique individual with different interests, talents and learning styles. Public Schools of Choice provides students access to innovative programming that engages and taps into their specific interests, aspirations and preferred learning styles. Round Rock ISD provides free bus service for students who live more than two miles from their assigned school and for students who live within two miles but along a route defined as “hazardous” to walkers or bike riders. Use the School & Bus Route Locator to find bus routes. Simply type in your home address to see the closest stops, pick-up and delivery times, and bus numbers. Transportation information will also be posted at the campuses the week before school begins. Each teacher or school has individual supply requests so it’s best to get the list directly from the campus. Many campuses have posted their lists on their school home web pages. Pre-packaged school supplies are often available from the campus PTA. Supply lists are also available at many local retailers. Round Rock ISD campuses serve student breakfast and lunch. Meals may be purchased with cash or a check at the cafeteria. Parents can also use MySchoolBucks to pre-pay online or over the phone with a credit card or electronic check. Students receiving free or reduced price lunches must submit an application each year. Applications will be sent home with each student on the first day of school. Additional copies are available in the cafeterias throughout the school year. Students receiving free/reduced lunches last school year will continue to receive benefits for 30 days. If an application is not submitted and processed by that time, the student status will automatically be changed to paid. Please allow up to two weeks for application processing. During that time new applicants will continue to be paid students until processing is complete. Learn more about Free and Reduced Meals. The SnapCode is like a key to your child’s registration for the upcoming school year. You should receive a unique SnapCode or SnapCode link for each child. Round Rock ISD will e-mail these to every parent starting in August. What if I haven’t received my SnapCode? Check SPAM mail or check to see if the e-mail is stacked with another e-mail. What if I received one SnapCode for one of my child but not the other? Check to see if the e-mail is stacked with your other student’s e-mail. Yes, because you’ll need to provide information that is specific for each child. We recommend that you submit one enrollment and then start another. This will allow you to “snap over” shared family information, which will save you time. If you’ve never completed an online registration with InfoSnap, you should create an InfoSnap Account. This allows you to securely save your work and come back at a later time if necessary. You can use your email address or cell phone number. If you already have an account, you can sign in and complete the form. You should use the same account to complete forms for multiple children. If you would like to make a change, click on the underlined field or click “< Prev” to return to a previous page. When you have finished entering your information, click “Submit.” This will send all of the information you’ve entered to the school. If you cannot click on this button, you will need to make sure that you have answered all required questions. Help! I’m having technical difficulties. For technical support, visit infosnap.zendesk.com or click “Contact Us” from any InfoSnap page. When can new students register for the next school year? New student registration opens in July. Parents/guardians need to follow the new student registration directions to submit required student online forms. Parents must come to the campus to validate address, immunization records, etc. When can returning students complete required annual forms? Usually in August, prior to the start of the new school year the District opens returning student online forms. At that time students, parents or guardians can log in to InfoSnap to review existing data, make necessary updates, and submit required annual information. If vital record changes are made — address, student name, date of birth, immunization records — parents must go to the campus to validate. How do I get the First Day Packet forms? There are no longer paper registration packets provided on the first day. Parents and guardians are asked to complete the Required Forms for Returning Student online. If parents/guardians do not complete the Required Forms for Returning Students online, your campus Registrar will provide your student forms to take home. Presenting a false record or falsifying records is an offense under Section 37.10, Penal code, and enrollment of the child under false documents subjects the person to liability for tuition or other costs. TEC Sec. 25.002(3)(d).